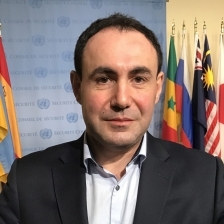 Irakli Beridze is in charge of the Centre for Artificial Intelligence and Robotics of the United Nations Interregional Crime and Justice Research Institute’s (UNICRI). Since 2014, organized number of AI related high-level events at the UNGA, and other international forums, identifying solutions that AI can contribute to the achievement of the UN Sustainable Development Goals. He is also responsible for initiating and organizing training programmes worldwide on AI and Robotics for wide range of stakeholders. He previously managed global projects on mitigating the risks related to weapons of mass destruction and has over 18 years’ experience in leading complex multilateral negotiations. Mr Beridze is a recipient of recognition on the awarding of the Nobel Peace Prize to the OPCW in 2013.